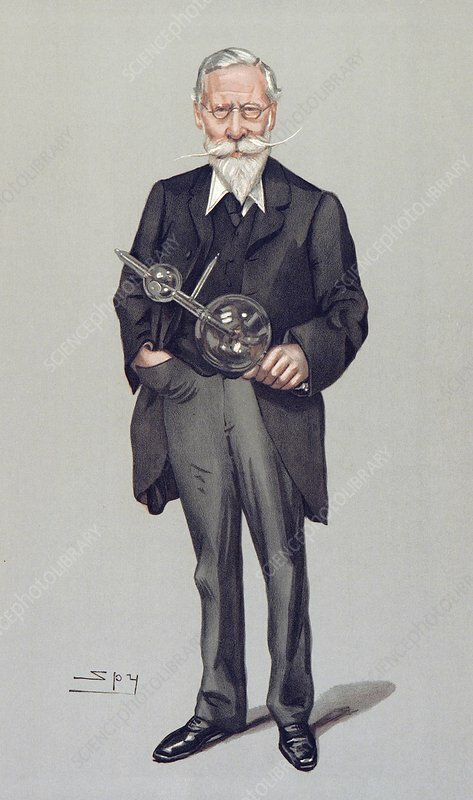 William Crookes with his vacuum tube, in a caricature published in the British weekly magazine Vanity Fair in 1903. The caption was: 'Ubi Crookes ibi lux' (Where Crookes is, there is light). British physicist and chemist Sir William Crookes (1832-1919) invented the Crookes tube, a forerunner to the cathode ray tube. Crookes used vacuum tubes to investigate cathode rays in 1878. He discovered that the rays (which were made of electrons) made the sides of the glass tube fluoresce. He also showed that the rays travelled in straight lines and that they could be deflected by a magnetic field. Artwork by Sir Leslie Ward ('Spy').